It is anticipated that the streets specified below will be fog sealed June 22nd or 23rd, barring unforeseen weather or mechanical difficulties. If your property is located along these areas, you will be notified of the exact date via door flyer. Please move your vehicles away from the street, and please do not water your yard that morning so that crews can fog seal streets effectively. Any vehicles not moved from the street will be towed at the owner’s expense. Streets being fog sealed will be blocked to any and all through traffic for approximately two hours depending on weather conditions. 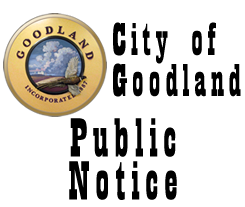 This notice was also published in the June 16th edition of the Goodland Star News.